Decorating Store Bought Cookies is easy when you use melted chocolate and sprinkles to add a fun and festive flair. 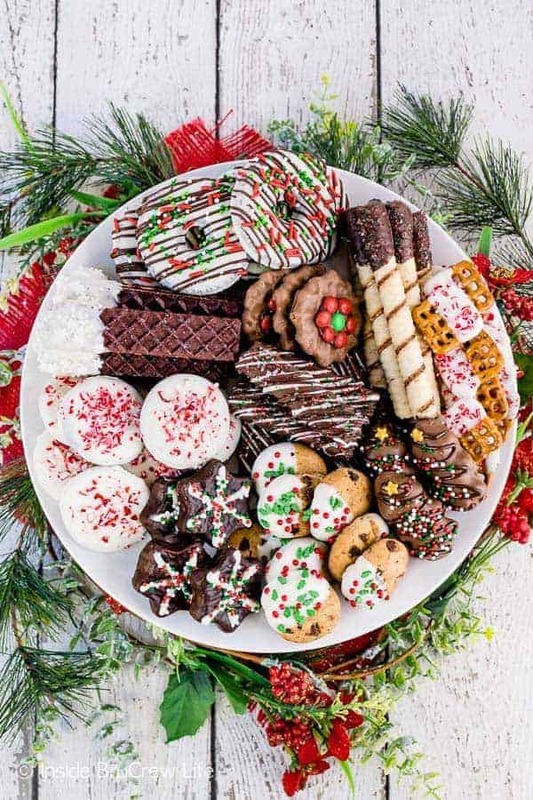 You will be the hit of the holiday parties when you show up with this plate of cookies, all without turning on your oven. There is something so fun about holiday cookies. It doesn’t matter if they are homemade or straight out of the store packaging. I love them all. One of the hot trending food items right now are charcuterie boards. These boards usually consist of meats, cheese, nuts, and fruit arranged in a random pattern. 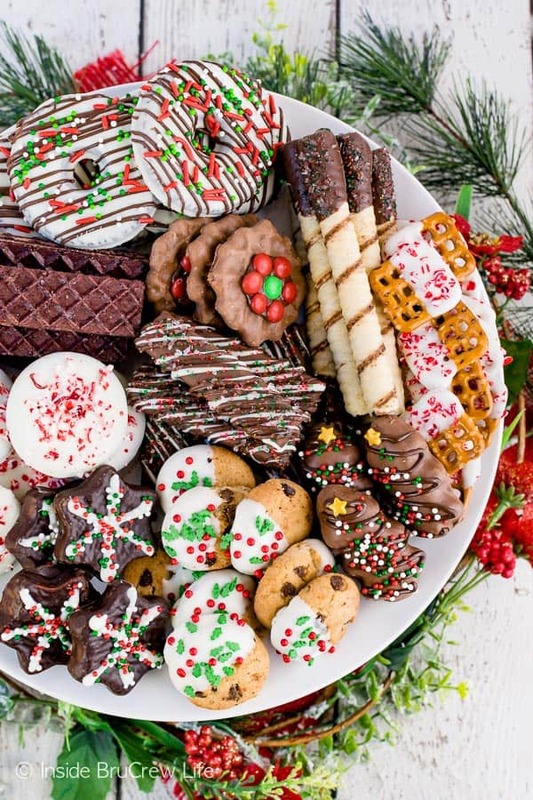 I figured it would be fun to put together a plate full of easy holiday cookies and candies in a similar pattern. Seriously! 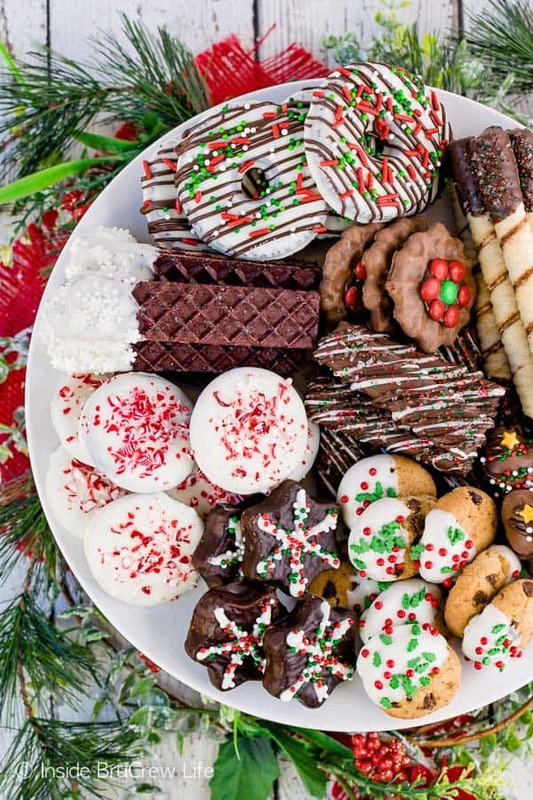 Look how fun and pretty this plate of cookies is. And you know the best part? You don’t need to spend hours in the kitchen baking anything. 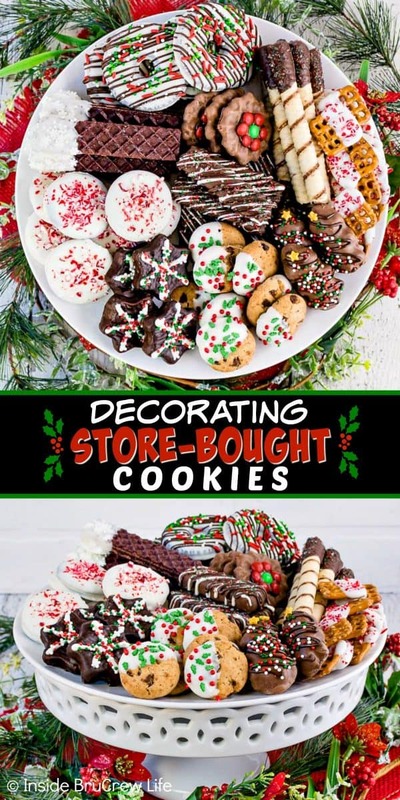 It’s amazing what you can do with grocery store cookies and some creative and easy decorating tricks. 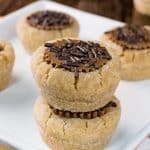 Now honestly I can’t wait to bake a few batches of these Peanut Butter Cup Cookies and these Chocolate Chip Cherry Cookies, but for some reason I really am all about the easy cookie decorating this year. When life gets busy just drizzle some chocolate on packaged cookies and throw some sprinkles on top. 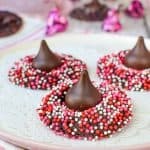 It’s the easy way to dress up store bought cookies in a hurry. Then rearrange them in a random pattern on a plate or a board and walk out the door to your party. 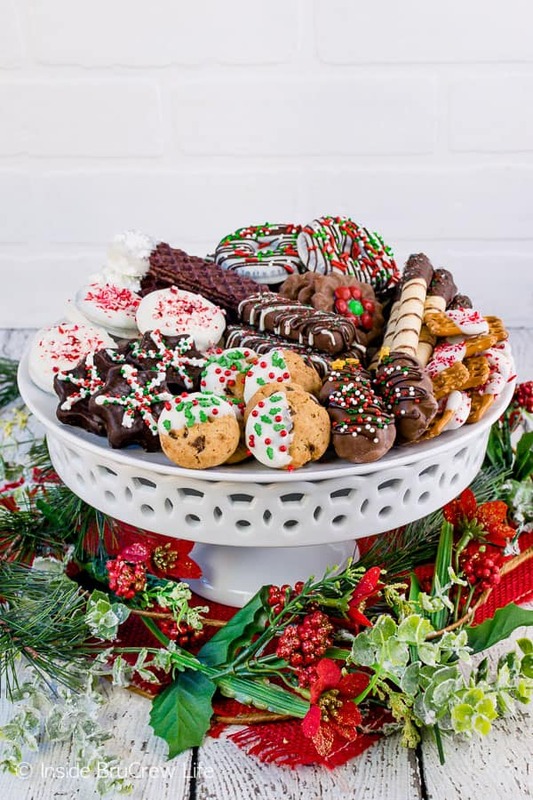 Chocolate and sprinkles always makes everyone smile, so they will never guess that this fun and festive tray only took you minutes to do. These are just a few that I picked up this time around. There are so many different varieties and shapes in the cookie aisle at the store, so do not feel limited to only these ones. 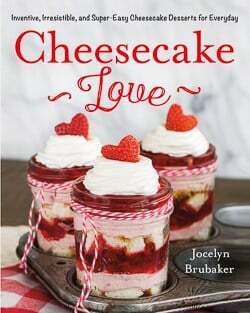 Let your creative juices flow as you wander the aisles at the grocery store. It’s amazing what a little bit of chocolate and some sprinkles or candy can do. You can also decorate snack cakes. A few years ago I made these Reindeer Snack Cakes out of Tasty Cakes. They are so cute and kids love them. Ok, who am I kidding. Adults love them too. 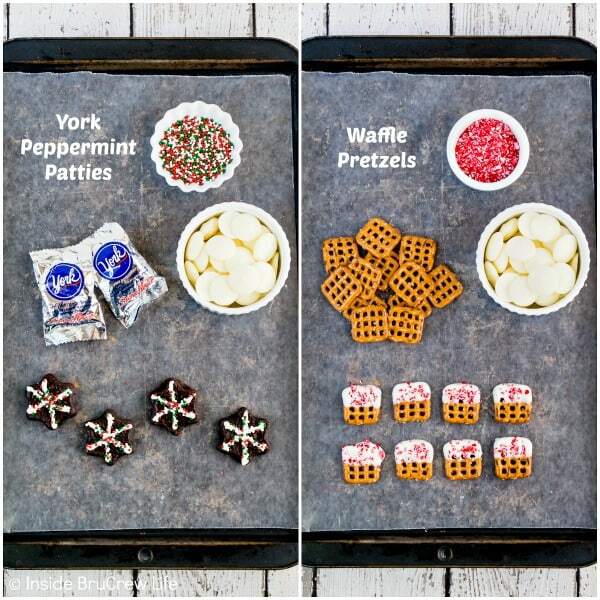 You do not have to buy special holiday sprinkle mixes. I like to pull all the jars of sprinkles out of our pantry and mix together different ones to make my own custom mixes. Get creative with the sprinkles and candies you already have before you head to the store for more. Set out the cookies and candies that you are going to be decorating. 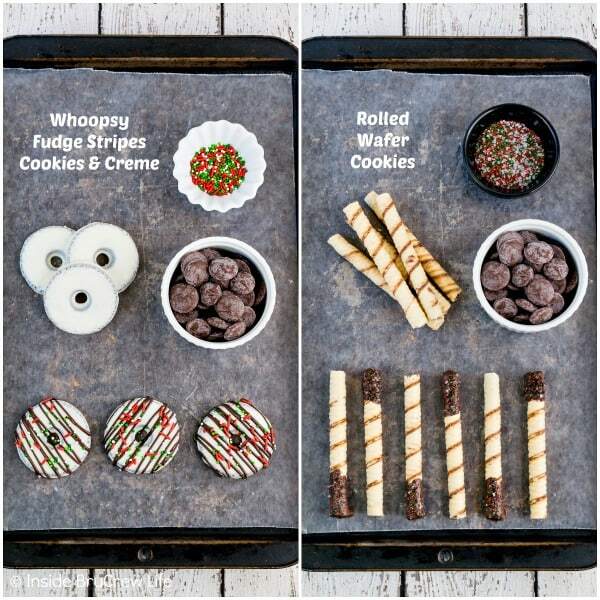 Decide what chocolate you want each one dipped in and what sprinkles will go on each cookie. Pour the sprinkles into bowls, so they are easier for everyone to reach. Unwrap candies and open cookie packages. Place them on different sheets of wax or parchment paper on the counter. This is a great task for kids to help with. Although, you may need to watch them closely or some of the candy might disappear. Our kids always have a habit of sneaking a few extras. Start with one kind of chocolate at a time. Melt the chocolate melts according to the package directions. 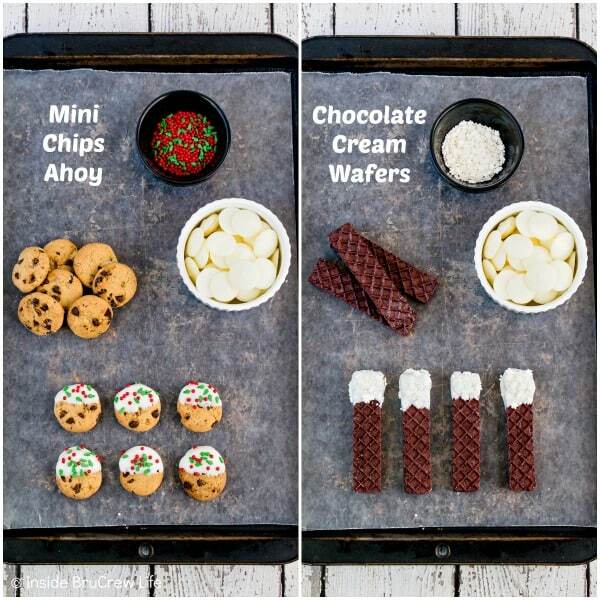 Dip all the cookies that you want in that chocolate. Make sure to add the sprinkles right away before the chocolate can set up. This is another easy task for younger kids to help with. 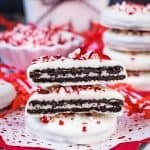 If you are covering an entire cookie, like these Peppermint Bark Oreo Thins, use a fork to flip the cookie in the chocolate and then lift the cookie out of the chocolate. Tap it gently on the bowl to remove the excess chocolate before placing it on the wax paper. 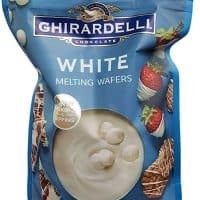 When you are decorating cookies and candies that already have a chocolate coating, spoon some of the melted chocolate into plastic baggies and cut one small corner off. 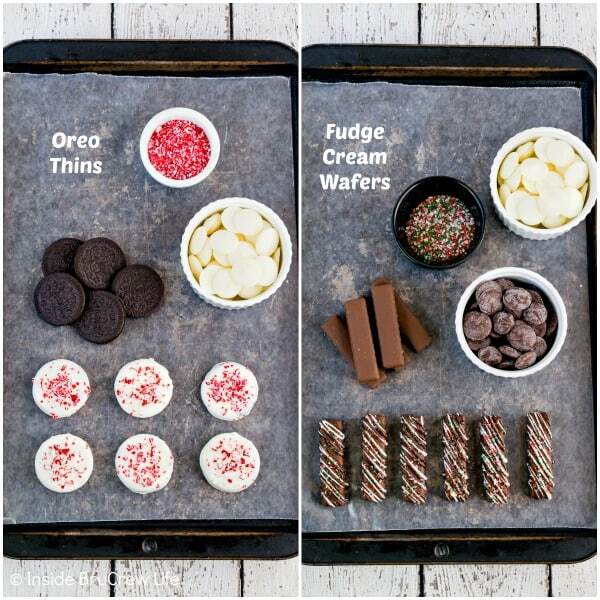 Drizzle the chocolate quickly over the treat and add some sprinkles. 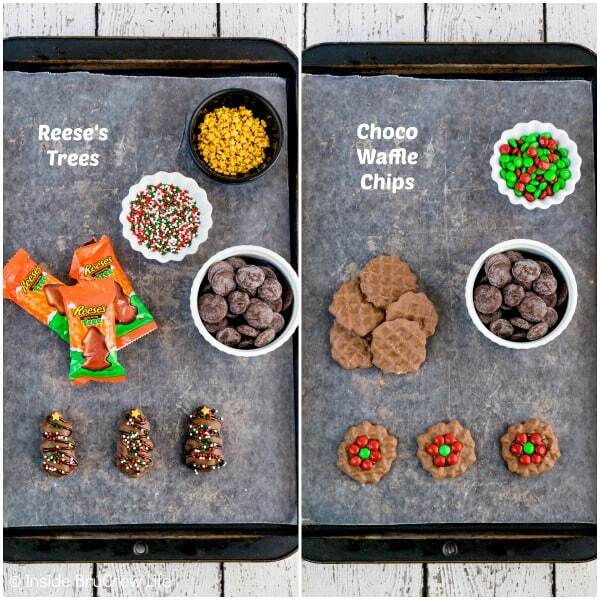 For the Reese’s trees, drizzle chocolate to match the chocolate coating, add nonpareils sprinkles for ornaments, and place a star sprinkle on the top. Drizzle white chocolate on the dark chocolate York Peppermint Patties in a snowflake pattern. You can use regular small peppermint patties too if you can’t find the snowflake ones. Add sprinkles before the chocolate sets. For the M&M’s flowers, drizzle little swirls of chocolate on the cookie where you want the candies to go. Press the candies on top carefully. Lay out sheets of parchment or wax paper for each cookie and candy that you are decorating. Unwrap and open the candies and cookies and place them on the sheets. Place the chocolate melts into different bowls. Melt one kind at a time and dip some of the cookies in that one. Make sure to add sprinkles right away before the chocolate sets up. 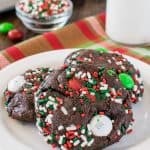 Melt the other kind of chocolate and dip the remaining cookies and add sprinkles. 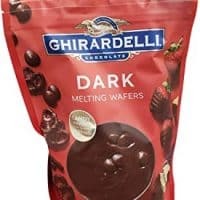 Spoon chocolate into plastic bags and cut one corner off. 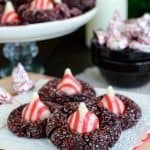 Drizzle the chocolates on the candies and cookies that are already coated in chocolate. Add sprinkles. These are best if served the first or second day. Store in a tightly sealed container. So many fun ideas! I love the Oreo version! This is such a great idea! Perfect for the busy holidays! Loving these ideas! 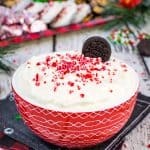 I can easily make a cookie platter for our Christmas party! Such fun ideas! And super easy too! 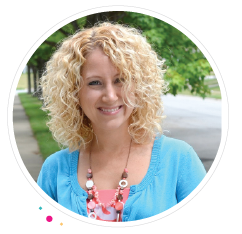 I love this idea…so easy! !